As a graduate student in molecular nutrition and novice runner, Maria has tried all the nutrition bars out there. After studying nutrition, Maria found it disheartening that major nutrition bar makers still use ingredients such as high-fructose corn syrup, hydrogenated oils and artificial flavors despite the recent research linking them to obesity, diabetes and cardiovascular disease. Friends and family also lament the laundry list of unpronounceable ingredients on the back of bar wrappers while simultaneously claiming that the product is "all natural". An avid baker, Maria started experimenting in the kitchen and voila, Maria's Chewy Bar was created. In another part of the Windy City, Jonathan had crashed by mid-morning after eating a sugary, processed energy bar. Jonathan was shocked at how unhealthy the mass-produced nutrition bar was that he had been eating for years. He found that most nutrition bars are loaded with saturated (or the 'bad') fat and refined sugar, while shortchanging us on fiber and polyunsaturated (the 'good') fat. Tinkering in his kitchen, Jonathan started making his own bars, which are high in protein, but still have plenty of fiber and are low in saturated fat. Our story may sound familiar. We believe many people, like us, care about what goes into their bodies. Not only should food nourish our body and soul, it should be made in such a way that sustains our planet. We also understand that we all have different tastes and nutritional needs. So it is important to cater our individual diets to our unique taste and nutritional requirements. 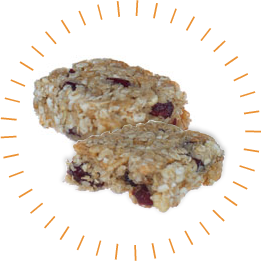 Besides being nourishing, we think nutrition bars should be enjoyable and fun! However, with today's busy, modern lifestyle, not everyone has the time to make his or her own nutrition bars. Jonathan Kelley joined the team & the two "Jonathans" worked to create an energy bar designed so that anyone could build their own bar as easily as checking their email. After sleepless nights & dozens of recipe perfections later, had been born! We are also constantly searching for more exciting elements that aren't offered anywhere else, so please come back to check out new ingredients and feel free to shoot us an E-mail to share your great ideas with us, give us feedback on how we're doing or just say hello!